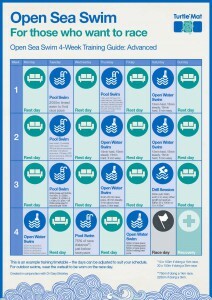 Open Sea Swimming Guide – 4-Week Training Plan - The Turtle Mat Blog - For news, features and competitions! The Turtle Mat Blog – For news, features and competitions! Rebecca Wilson on the subject of Tales from Turtle Towers,The Great Outdoors. Posted on July 2nd, 2014. With Turtle Mat employee Heather taking part in MCS’s charity open sea swimming event the Big Sea Swim, we decided to offer a helping hand to anyone who is taking part in a swimming event to get the most from their training. 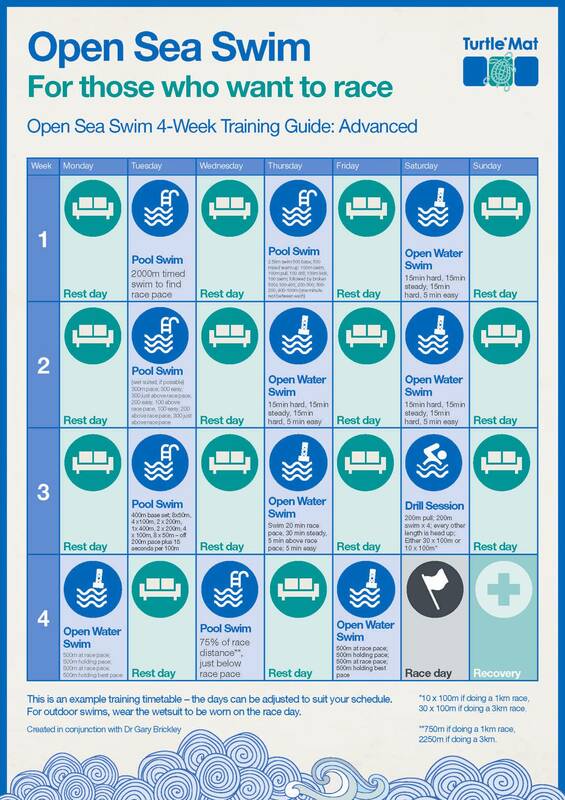 Working together with Olympic and Paralympic coach Dr Gary Brickley, we have created a four week training plan for those looking to give their training a boost in the last run-up to their event. A lot depends on how much time you have available and if you have access to water. 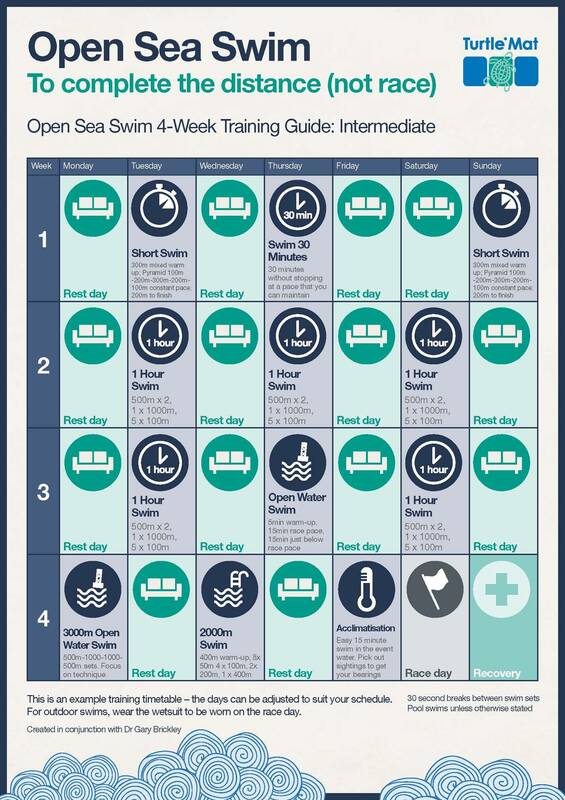 The swims are a great guide to build your endurance going into the race and to develop your confidence in swimming in open water. Ideally you will have someone watching over you or helping to set the pace. Get your bearings of the course, what will you line up with? Get on someone’s feet whilst you are swimming, this will make sure you don’t have to keep looking up and it will save some energy as the person in front will break the water in front of you. When you finish your swim try not to just collapse when you cross the line. Jump back in the sea and swim easy for 5 minutes or so to loosen off your muscles and to gradually drop your heart rate. You may decide to take your wetsuit off and just stretch out in your swimming costume. After each session you should ideally be eating within 30 minutes of swimming to make sure you can restore your stores. A mixture of high quality protein with some carbohydrates is recommended. You can of course use sports drinks but something like a milkshake would be ideal. If you have been in the water for around an hour you may sweat up to a litre of water and this may need replacing with an electrolyte drink to ensure you are rehydrated. 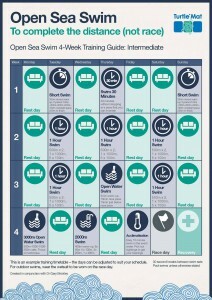 Have a good stretch out on land as well as in the sea afterwards and then look forward to your next big swim. Hopefully you will have hit your goal whether they are completing or doing your best possible swim. Our guides were created in conjunction with Dr Gary Brickley. Gary is a senior lecturer in exercise physiology based at the University of Brighton in Eastbourne. He is an accredited sport and exercise scientist and an accomplished swimmer. He has swum the English Channel in a 3 man relay; completed the 26km Lake Zurich swim coming 3rd in the masters category; is currently the Brighton Pier to Pier veteran cup holder; has swum the 19.6km Rottnest Island swim in Perth and also did the 24 miles swim, swimming 1 mile every hour for 24 hours. Thanks Dr. Brickley, some really sound and simple advice! Great stuff. Hopefully we’ll see you at the Marine Conservation Society’s Eastbourne Big Sea Swim on July 11th? http://www.mcsuk.org/swim Perhaps head up a team from the Sport Brighton dept’ based in Eastbourne?! Kind regards, Alisdair @ MCS.